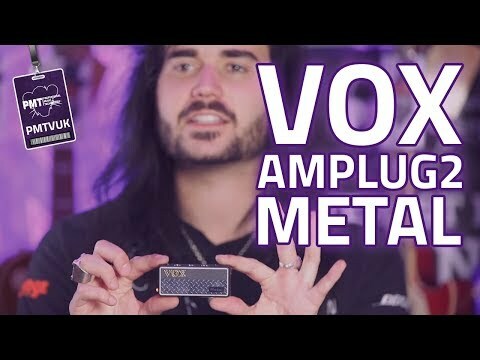 The new Vox amPlug amps are an update on the original mk1 versions, with brand new features, including essential guitar FX and a very conven.. The new Vox amPlug amps are an update on the original mk1 versions, with brand new features, including essential guitar FX and a very convenient rotating jack. This is the mini Metal amp, which delivers a mighty US high-gain heavy metal tone, but in a tiny package. Along with the versatile Gain, Tone and Volume controls there is also an AUX in jack for connecting and playing music from any other player like an MP3 or your mobile phone. A couple of alkaline AAA batteries powers the amPlug 2 for up to 10 hours and the new auto power off feature can save battery waste and keeping you rocking for longer. Perfect for late night practice or when you just want to lose yourself jamming with a pair of cans and your favourite guitar over your shoulder, amPlug 2 is the total solution. Plugging in to your guitar is now even easier thanks to the newly engineered jack plug that features a 180 degree rotating movement. So regardless of your guitar’s jack location or whether you prefer to sit or stand you can angle the amPlug 2 for comfort and convenient access to its controls. The guitar models in the amPlug 2 series all feature an extra FX Switch allowing you to add that all essential Reverb, Chorus or Delay effect for a huge spatial sound normally only found on high end amps or pedal boards.